Upon entering the human resources office, a sense of sterility returns, as plenty of air freshener diffuses into the white tile room. It is quiet except for the occasional “hello” from a passing supervisor to Tiffany, the receptionist. Then, there is commotion in the side room that connects the HR office to the chicken processing area. Lebon Dauda, a translator and training supervisor, confidently enters the office with two women following behind. The women move slowly, while Dauda maintains his upbeat pace. The three have been working since midnight. It is now 8:38 a.m. Speaking Swahili, Dauda motions for them to sit at a table lined with laptops. He begins giving instructions for the online company survey. All of the instructions are written in English. He reads each question then asks it aloud in Swahili. This continues until the women answer all 57 questions. Lebon Dauda started as an associate at Perdue in the fall of 2014, after immigrating to the United States from Africa. Originally from the Democratic Republic of Congo, Dauda came to the U.S. to protect his family and left behind a job he loved, a degree in computer management and his dreams of helping his country find peace and democracy. He is one of thousands of refugees who found work in the meat processing industry almost immediately upon arrival in the U.S. Yet, Dauda has managed to make the job that started as “the only option,” and remains that way for many immigrants, his platform to help others succeed in their daily lives. Lebon Dauda was born in Congo’s largest province, Bukavu in 1985, during the notorious dictator Joseph Mobutu’s gradual and violent fall from power. As the country transitioned under the new presidency of Laurent-Desire Kabila, a short time of peace preceeded increasingly violent conflicts between government and rebel groups. During the nation’s pivotal years, Dauda attended primary school. He was fortunate to have a private education in which he studied mathematics, literature and his favorite subject, philosophy. Dauda enjoyed the works and theories of philosphers like Isaac Newton and Socrates. He idolized Socrates for his ability to analyze the human mind and body so thoroughly. He found his methods to be extremely effective in sharing ideas and persuading others. Although Dauda’s uncle wanted him to begin studying ministry and enter the priesthood, Dauda decided that upon graduating from high school, he would attend university to further study philosophy and broaden his perspective on the world. In 2002, Dauda began his college career at the public University of Goma. He continued to study philosophy and the government, and he realized he also had a natural ability in the sciences. Dauda received a degree in computer management from the university in 2006, the same year in which Congo held its first free elections in four decades. Joseph Kabila, son of the former president Laurent-Desire Kabila, was elected. Focused on the tumultuous state of governmental and social affairs, Dauda found a job doing what he loved most: helping others and working to protect human rights. Dauda began working for Oxfam International, a non-profit organization that focuses on ending poverty by creating targeted programs for nations’ poorest regions. He worked in the DRC partnership organization to keep citizens who advocated for democracy and other “radicals” safe from the government’s violent army and rebel groups. He also advocated for human rights. Although President Kabila promised change and reform for the country, rebel tensions and government corruption led Dauda and the rest of the Congolese people further from the democracy they were promised. In early 2009, during a period of heightened civil unrest and some of the most violent rebel activity, Dauda began to question his abilities to help his country. All around him, civilians, family, friends, those he’d been fighting to protect were becoming casualties of one of the largest conflicts in African history. It was winter, the rainy season for the inhabitants of the river city Bukavu on the eastern edge of the Democratic Republic of Congo. The skies were unusually clear that evening as Dauda sped home through crowded streets on his motorbike. As he rode up to his home, dread grew inside of him. He immediately noticed the white car. Inside were four men, waiting to carry Dauda to his death. Within seconds, the men forced Dauda into the car. He took one last look at the clear, dimming sky before the drugs the men injected began to overtake his system. Dauda awoke in an empty room in the detention center where the Underground Security Service, a faction of government-appointed law enforcement, had thrown him without explanation. But Dauda knew what he had done. He was whipped and beaten for attempting to defend civilians from a corrupt governmental system. With each whipping, he remembered the people he’d fought for. When they whipped with strips of tree bark, he remembered his family, the sisters and brothers whose rights he strove to protect. When they used tire rubber to rip into his back and chest, he remembered those who died before him, those who once inspired him. “I will be killed, but my message will remain,” Dauda said to his aggressors as they waited for the signal from higher authorities to deal the final blow. For two weeks, Dauda sat imprisoned, awaiting death — the death that came to those who spoke out against government corruption and advocated for the rights of humanity. As Dauda sat on the cold hard floor of his cell, weak from torture and malnutrition, he was unaware of the commotion in the streets. Outside, just miles away from his own detention center, university students were protesting for his freedom. Students crowded the streets of his city to demand his release. Soon after the protests, Dauda was released and relocated to Zimbabwe under special recommendation by the United Nations. By the end of 2009, he settled just outside Harare and started working as a software database developer and translator for the Jesuit Refugee Service in the Tongogara Refugee Camp. The JRS worked closely with the United Nations to help ensure refugees had the supplies and shelter they needed while living in the camp. Dauda would stay five more years in Zimbabwe, where he met and married his wife Florance. They had their first daughter, Beige, in 2011. By 2014, Dauda questioned his safety in the refugee camp, and he knew that he would have to leave Zimbabwe in order to protect his growing family. 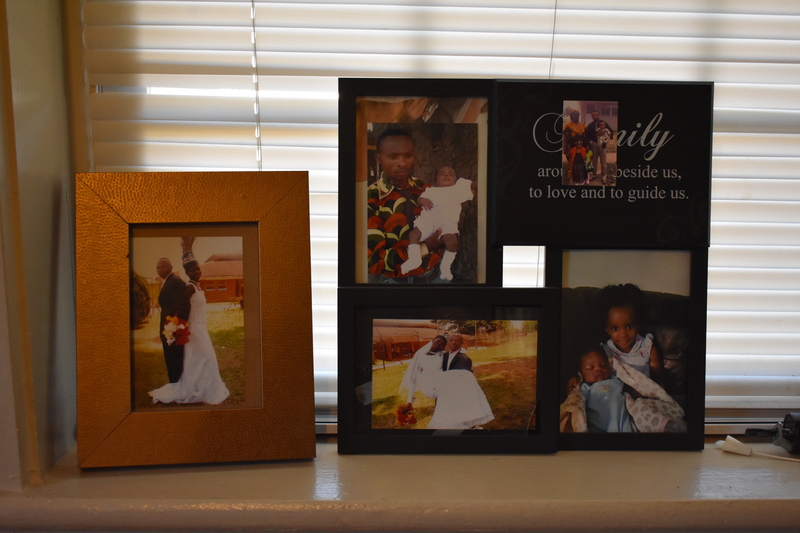 Photographs of major family events, including weddings and birthdays, rest on the windowsill at the Dauda home. Soon, Dauda’s colleagues at the UN set him up with immigration agents in Zimbabwe and the U.S. who would help him relocate. Just before receiving his visa, he met with a friend and trusted adviser, Father David Holcroft. Father Holcroft spoke to Dauda about the promise of America and all the wealth it could bring. Yet, he warned that an immigrant had to adhere to a certain set of rules if he wanted success in the Land of the Free. With these parting words in the back of his mind, Dauda and his family resettled in New York City in the early fall of 2014. After analyzing many other options Dauda decided to move his family to Bowling Green, Kentucky, because of its low cost of living and more temperate climate and because he knew of the relatively large African community there. In October 2014, Lebon Dauda resettled one last time in hopes of finding a new place to share his passion for humanity with a welcoming community. Bowling Green has the second largest refugee population in Kentucky, with almost 4,000 resettlements since 2002, according to the Department of State’s Refugee Processing Center. Last year, Congolese citizens made up the largest population of refugee arrivals in Kentucky and the U.S. due to the increasingly dangerous state of affairs in Congo. Upon his arrival in Bowling Green, Dauda sought out employment and housing options for himself and his family. He went to the International Center of Kentucky, where he received a tour of important places in the city, such as the hospital, Food Stamp Office and Social Security Office. Then, Dauda met Kelly Rice, the employment program manager at the International Center. That chicken company was Perdue Farms, Inc., the poultry processing plant 30 minutes from Bowling Green. Dauda was reluctant to take the job at Perdue, as he was an educated man with a degree from his home country, and the work there seemed purposeless. In the earliest hours of one cold October morning, Dauda started out on the third shift at Perdue. He began on the “wing line,” an assembly line that handled and separated the chickens’ wings. The job involved long hours of standing, working with raw poultry and lifting heavy shipping materials. But there was something inside Dauda, telling him to persevere and to continue his employment with Perdue. Perhaps it was a value instilled in him from a young age. Perhaps it was a small remembrance of Father Holcroft’s advice. By the next year, Dauda had asked to switch departments. As he moved around he experienced more hard work, heavy lifting, repulsive smells and time away from his family. Yet, Dauda remained engaged in his work. He was determined to prove himself worthy of a higher position. One day his supervisors called Dauda into the office. He had been working with the company for almost two years when the managers told him that they’d noticed his strong work ethic. The human resources manager at the time inquired about his language ability and was impressed to find out that he spoke six languages. Dauda became a translator for Perdue in 2015, just after his wife gave birth to their second daughter, Megan. Now, Dauda works under the current human resources manager, Sidney Vowell, as a translating supervisor trainer. Vowell believes that Dauda is an asset to the Perdue team because of his optimistic attitude but also because he remains positive about the work and the company. In a place where much of the workday is spent in a semi-dark, cold, wet room filled with raw meat, Dauda’s enthusiasm is surprising to many. Perdue Farms, Inc. is one of the top 10 poultry processing companies in the U.S., according to an industry study by The National Provisioner. Many of the country’s top performing meat companies employ a large number of foreign-born workers for their processing and packing divisions. A 2010 peer-reviewed study in the Choices publication of the Agriculture and Applied Economics Association states that about one-third of the meat industry workers are foreign-born. This causes issues such as language barriers and lower rates of health care throughout the industry as immigrants are less likely to apply for or receive coverage, according to a similar 2016 article from the publication. Although Perdue does offer a benefits package to its full-time employees, some feel it is hard to understand exactly how to obtain the benefits, or they simply feel it is not enough to compensate for the work they are doing. 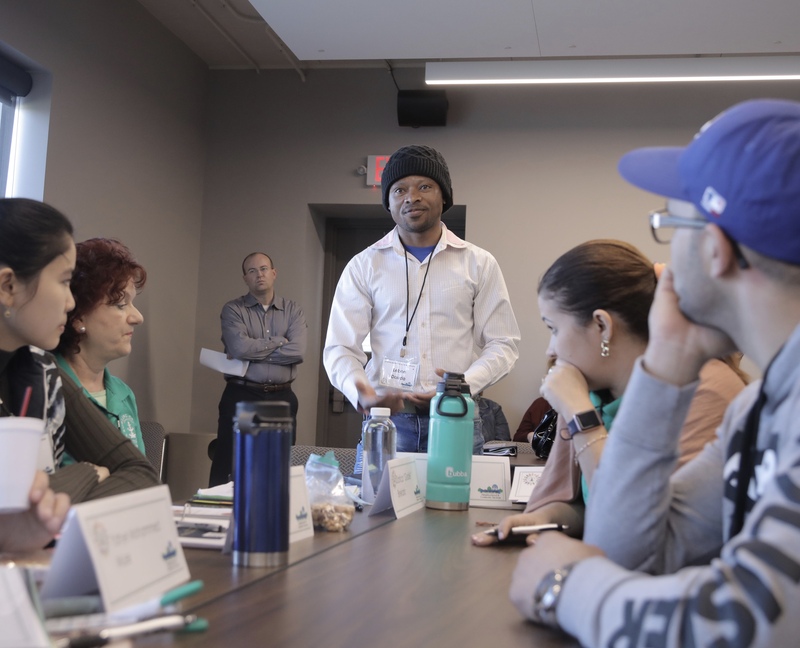 Perdue employee and Congolese refugee Bushiri Olomwene explained that it is hard to help everyone understand their benefits and the rights they have as employees when many people cannot learn English. Dauda knows that he has a large responsibility to uphold at Perdue, as the number of Swahili speakers grows each year. Although he said it can be overwhelming, Dauda has plans to try to educate as many employees as he possibly can so that they can have the same opportunities to grow at work and in their communities. In the meantime he also educates his American coworkers on African customs so that there is positive communication from both sides. Dauda said he considers himself lucky. He had the opportunity to learn British English through his education and his different jobs in Africa. It only took him around three months to become comfortable speaking English in America. Others, he said, do not have the same luxuries as he does. As a translator at Perdue, Dauda has renewed his passion for service. He often tries to reach beyond his duties at Perdue to help fellow refugees in their work and daily lives. When Olomwene arrived in Bowling Green in the fall of 2017, Dauda showed him around the city. The important places, such as the hospital and Social Security Office. Dauda helped Olomwene find work at Perdue and invited him to neighborhood gatherings so that he might meet others in the community. 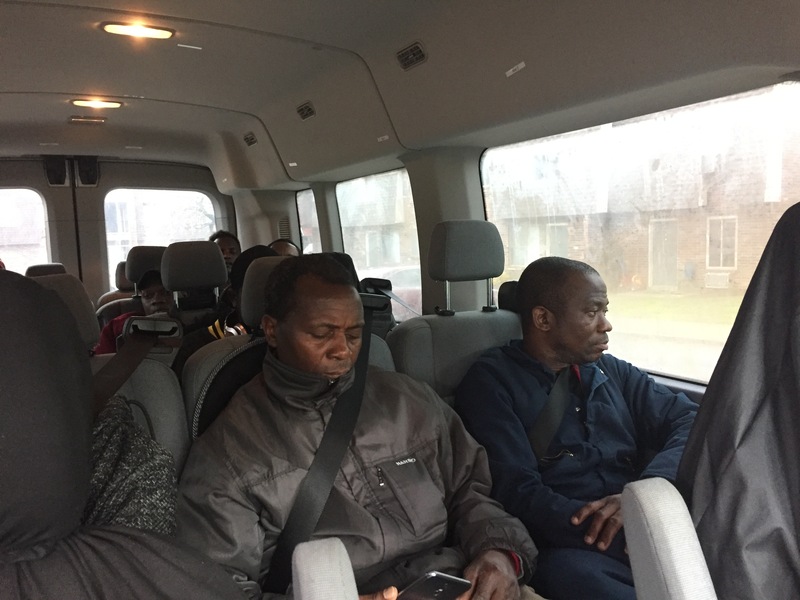 Each morning, the two ride with 13 others in Dauda’s 15-passenger van, which he proudly purchased in 2016. Bushiri Olomwene (right) watches out the window of Dauda’s van as his colleagues get dropped off after a long night of work on April 24, 2018. Olomwene continued to stress the importance of having Dauda at work to translate for him and the other African employees. Dauda said the job has also reignited his spirit of advocacy. A spirit that thrived in him at his home in Congo. Dauda has worked with different neighborhood groups over the past three years in order to advocate for more educational programs for Bowling Green’s immigrant and refugee populations. Most recently, his work with the international community earned him a spot in the 2018 class of the Academy for New Americans. This group meets monthly to explore aspects of the government more in-depth and expand accessibility to government services, according to international communities liaison Leyda Becker. Becker, who emigrated from Venezuela in 1993, was in charge of selecting the class of 30 from the pile of applicants. She said she recognized a special sense of leadership in Dauda that makes him a perfect candidate for the program. With his newfound understanding of how to navigate the government and promote enrichment for international communities, Dauda hopes he can share this knowledge through his work at Perdue and perhaps beyond. Dauda wants to continue his education in order to become a human resources manager because he believes it is a valuable position in any company. He is starting the pursuit by earning a degree at the online Universtiy of Phoenix. Dauda admits that he knows little of the university, which often faces scrutiny for its high prices and the low value of its degrees. Still, Dauda feels that it is an important opportunity to take because Perdue will fully reimburse his studies if he is able to maintain a high GPA. However, his end goals lie futher down the road. He hopes to earn a master’s degree and to continue studying philosphy and people. 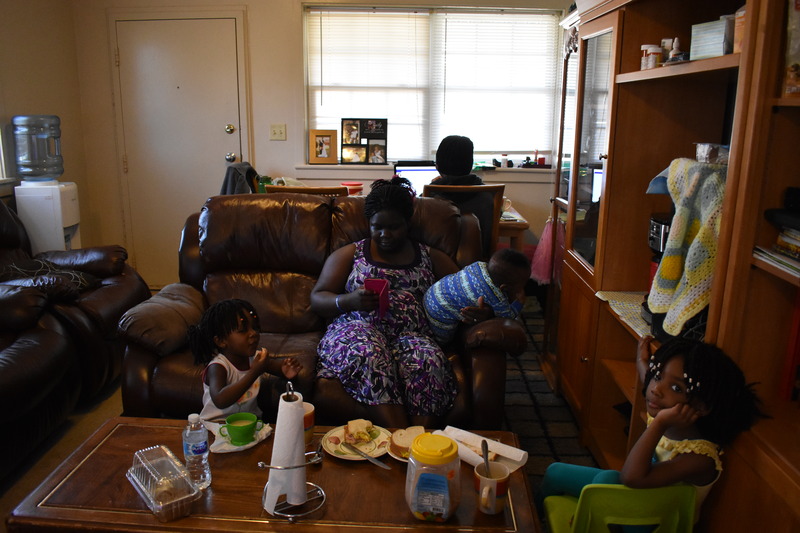 Dauda’s wife Florance holds their youngest child, Michael, while Megan (left) and Beige (right) eat breakfast on February 18, 2018. On a bright Sunday morning, Dauda sat with his laptop computer on the dining table in the living room. Now 7-year-old Beige stepped out of a side room carrying her 7-month-old brother Michael. He was sliding down in her arms until she hoisted him onto the couch and began to sing along with the song playing on the plasma screen. Middle sister Megan walked into the room with a plastic stethoscope around her neck, playing doctor as her older sister kept a careful watch over the scene. “I need you to reduce the volume on the television,” Dauda scolded, as he prepared to take the Berlitz English Language placement test, which would determine his acceptance into the University of Phoenix. In the kitchen, Florance clanged dishes as egg sandwiches on white bread were followed by bowls of golden brown, cake-like mandazi. Soon, Florance placed a mug filled with coffee on the table in front of Dauda. He drank as he read the highly specific preliminary instructions for the test. “OK. I think I’m ready.” Dauda’s cursor hovered over the big yellow “Begin” button. With the twitch of a finger, Lebon Dauda took the first step toward a new beginning.